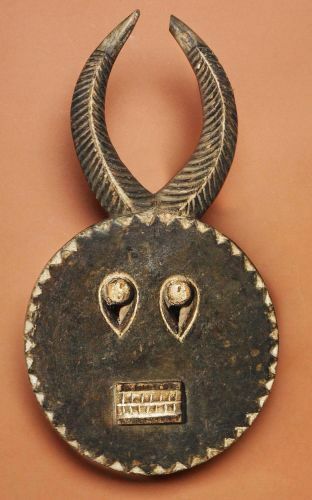 The disk shaped Kplekple facemasks include antelope shaped horns, round eyes, rectangular shaped mouth and geometric designs. The red face is considered female and the dark/black face is considered male. The Goli masquerading tradition is performed during funerals and or during times of danger. The mask wearer mediates with supernatural forces during the ritual, which have a positive influence on the village people.